Gopher control always means gopher killing. It is simply not possible to trap and release a gopher elsewhere, because the fast metabolism of the animal would cause it to expire of hunger and thirst before it could be released from the trap. The best way to dispatch a gopher is with a sharp, mechanical stabbing action or with an electric shock, sparing it any suffering and removing it from your yard. We prefer the Victor 0625 Black box Gopher Trap for killing gophers. It kills the gopher very quickly, and there is a minimum of blood and gore to clean up, or to attract predators that might take the dead gopher and your trap with them if it is not staked down. The Victor Black box trap takes a little more work to set, but it is far easier to reuse after the kill. For a little lower cost per unit but about the same cost per gopher, we also recommend the older-style mechanical traps such as Sweeney’s Gopher Trap, which impales the gopher to ensure quick death, and the Victor 0611 Easy Set Gopher Trap Twin-Pack, which kills the gopher with a quick pincer action. These mechanical traps cost less up front, but they don’t last as long and require more maintenance. Still, if you live in an especially damp climate, you may prefer mechanical gopher traps that work even during heavy rains. There is no reason not to use all three devices, just in case the gophers on your property have become “trap wise” to one but not the others. Also be sure to buy heavy gloves to wear when you handle the traps to mask your scent. The consumer product reviews we have posted with these products give the information you need to use each one even more effectively than you can following the manufacturer’s printed instructions. Gopher traps are something of a specialty item. Even the largest home supply centres often don’t carry them. We recommend that you shop Amazon.com for the best selection and the lowest price, with free shipping for orders over $25. You can quickly go to any part of this review by clicking on the links below. The Victor 0625 Black Box Gopher Trap is by far the most effective way of trapping gophers fast, that I have ever tried, but the instructions that come with it aren’t the greatest. If you don’t know these essentials, then it is more or less a matter of luck. If you do, you will be well on your way to catching them fast. The gopher trap only works in an established gopher tunnel. You can locate the tunnels with a sharp metal tool. Locate a gopher hole, and then test the ground in all directions about a foot away from the hole until it slips through with minimal distance, about a foot down. That’s where the tunnel is, and that’s where you need to put the trap. Never, ever pick up the trap with your bare hands, whether they are washed or unwashed. You’ll leave your scent on the trap and the gophers will just dig around it. 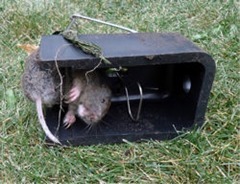 I didn’t know this the first time I tried to use a gopher trap and I didn’t get results with my first one. Have a stake ready when you set out your trap. (No, this isn’t in case you come across a vampire gopher.) At least where I live, coyotes will smell, dig up, and carry away the trap, if there’s a gopher in it and it’s not staked into the ground. The stake also needs to be handled with gloved hands. Just in case it’s not clear, and the first time I tried to use the Victor 0625 Black Box Trap, it wasn’t to me, the opening of the trap has to be in line with the direction of the tunnel, so that a gopher seeking to go topside would go into the trap. If you put the trap in sideways you aren’t going to catch any gophers. Don’t pack dirt over the trap. Too much weight on the trap interferes with the spring mechanism. I find it easiest to use a shoebox with a flap cut out of the box sticking above the ground so I can unearth the trap easily for inspection, but, again, you can’t have used to the box to have stored shoes you have already worn. Leave the trap in place overnight before checking, but don’t leave it more than 24 hours without inspecting it. If the trap has been filled in with dirt, pick it up with gloves on your hands, shake it out, and set it somewhere else. You can fool a gopher once but you probably can’t fool a gopher twice. You can catch more than one gopher in the same location if the trap isn’t filled in. I notice other reviewers say they wash out the trap between uses, but I never do this. Be on the lookout for gopher holes near soft dirt, such as where you recently put in a water pipe or the power company put in an electric line. Gophers like to dig in loose dirt, and they like to gnaw on insulation. Sure, gnawing off the insulation on an electrical line will also kill the gopher, but it’s better to trap it first so your lights don’t go out. This is one of the best pincer or pincher traps. It costs a little more, but it’s a lot easier and safer to use, and it works. 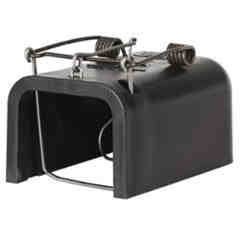 Follow this link to read customer reviews and get the best price for the Black Box Trap on Amazon. Sweeney’s Gopher Traps don’t just kill gophers. They run them through so there’s no chance of escape. It is a quick death, so as killing animals goes, it is a humane death, but I’ve found that getting good results requires more than one trap. Just as the manufacturer’s diagram shows, it’s important to set out at least three traps per tunnel, one trap on either side of a dig about a foot away from the tunnel opening (in the tunnel, of course), so there is a trap to capture the gopher no matter which way it is going, and a trap in the tunnel as goes up to the surface. It may seem like obvious advice, but it wasn’t obvious to me: When you are setting the trap in the entrance to the tunnel, you put it on the lower side of the entrance. Don’t try to stake it upside down. How many gophers can you trap with the Sweeney Gopher Trap? Using 3 traps per tunnel and dealing with 8 tunnels, I have caught over 100 gophers in the last month. Obviously, it’s better to tackle the problem before you get this many of the little pests in your yard, but this gopher trap doesn’t require any poisons, doesn’t endanger kids or pets, and is a heck of a lot cheaper than some of the alternatives. I just wish I had started my gopher control project a lot sooner. 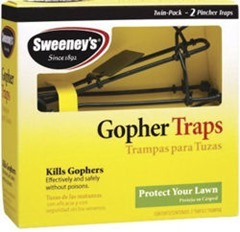 One of the best places to buy Sweeney’s Gopher traps is on Amazon. You can read customer reviews and quickly compare prices. If you are looking to get rid of a lot of gophers without rototilling to get rid of grass roots, putting out poisons that can kill pets or wildlife, electric gopher zappers, electric fences, sonic devices that can drive your dog crazy, flooding, flame throwers, car exhaust, or nuclear weapons, the Victor 0611 is a good way to go. I give this product five stars, but that’s because I have learned how to use it efficiently. It takes a little practice to use this trap right, but once you do, the low cost and ease of use make it a real winner. The most important thing to realize about the Victor 0611 is that easy to set means easy to break. It’s important not to apply too much pressure when you are bending the wires that engage the trigger. Also, after half a dozen uses or so the pinchers begin to come loose, so you’ll probably need to replace the trap. And if you don’t stake the trap, the gopher’s dying act may be to carry the trap farther into the tunnel out of your reach, or at least requiring you to do a lot of digging to retrieve the trap. No matter. At this price, it’s OK if the trap wears out after it’s caught 10 gophers. The only other thing I can think of is to be sure to replace the sod over the tunnel where you lay the trap. If you give the gophers a skylight they won’t trip the trap. Check out other reviews, read more details about the trap and buy the Victor easy set trap on Amazon. The Victor mouse trap has been reviewed and compared with the “Mice Cube” trap, Snap-E mouse trap & Hygeinic traps. They all have their advantages and disadvantages. However, you will find one to match your budget. Rat zappers are the ultimate rat trap. They are quick to set up, easy to use and very effective. Read the full review here, watch a short video of it in action and compare it to the Havahart and Victor traps. Free Do It Yourself Pest Control Guide. Learn about best practices, understand how to prevent pests from squatting in your house or garden, what to do if you have an infestation and which are the best traps to use for specific pests. There is a wide range of slug and snail baits available, we help you understand which are the most effective for your situation. Copper slug and snail repellents & barriers are extremely effective at keeping these slimy pests off your prized plants, and they won’t harm your pets. it is unclear to me how to properly dig the trap holes and cover the trap without fouling the trap and or blocking the tunnel. It seems to me that a better way to repel the animal would be to stick two electrodes into the moist ground about 4′ apart and perriotically release an electrical current over a period of a week or so would drive away all gophers. What about that? Hi John, I’ve never tried using the electrodes. If you do an experiment with it, please let us know how you get on.